After my sister mentioned that one of my galaxy manis reminded her of Van Gogh (quite the compliment! ), I decided to pay homage to another artist. 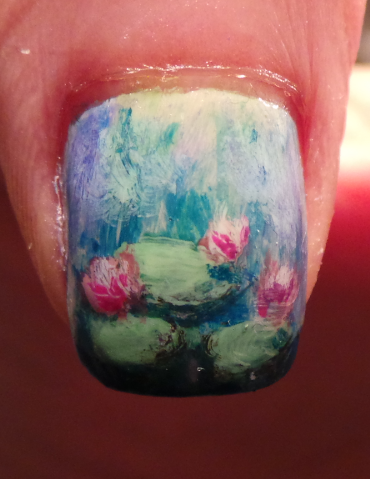 Monet's Waterlilies series has always been a favorite of mine - I hope I haven't done it too much injustice! My thumb turned out the best. I think it's due to composition. Since my thumb is the largest 'canvas' (see what I did there? ), the scale of which I made the pads and lilies really works. I kept the same size on my other nails, but I should have made them a wee bit smaller. Live and learn! I need to work on my freehand art, but part of the problem is definitely not having a lot of practice with nail art brushes. Lots of bloggers say they cut their brushes down to size. I've done so, but not sure I did it right. Overall, I'm still pleased with this. Not having a lot of practice, I think I took on a pretty lofty challenge and did OK! It helps that impressionism doesn't require a great deal of precision. I finished this mani with a coat of Cult Nails Wax That, since I figured an old painting shouldn't look too glossy.